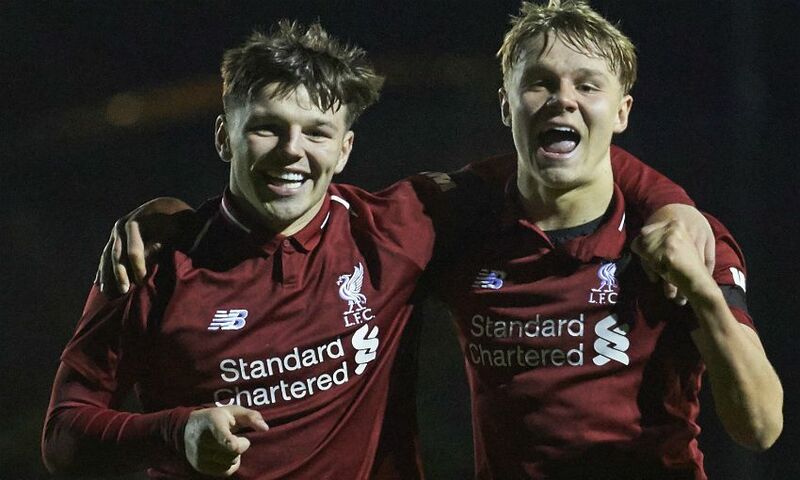 Jack Bearne’s 90th-minute winner earned Liverpool U18s a 4-3 win over Everton in a thrilling, top-of-the-table mini-derby at the Academy on Thursday night. 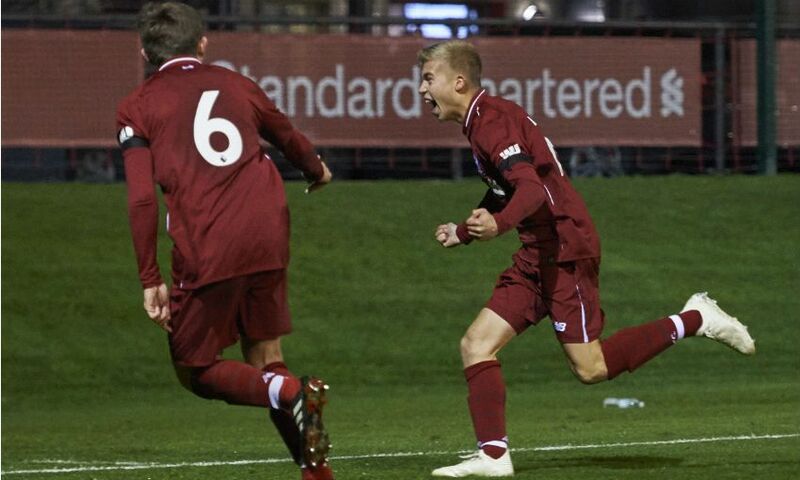 After coming on as a late substitute, Bearne flicked a header from Leighton Clarkson’s wicked delivery into the bottom corner to move the young Reds to within a point of their U18 Premier League-leading neighbours. It appeared that Barry Lewtas’ team would have to settle for a draw after they’d ceded a 3-1 lead given to them by early goals in each half from Bobby Duncan and Paul Glatzel, along with a fine Clarkson free-kick. Korede Adedoyin, who had equalised Duncan’s opener before half-time, made it 3-2 on the hour, before Kieran Phillips levelled for the Blues with 11 minutes left. However, just as they did in their last home outing versus Manchester City, Liverpool dug deep to find a late, decisive goal. 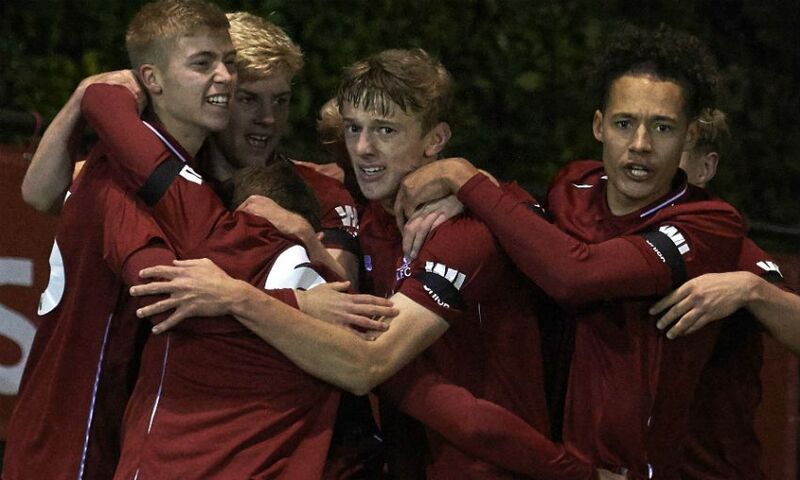 The young Reds have now won eight matches in a row, and retain a game in hand over Everton. Barely 90 seconds had elapsed when Duncan put the hosts ahead. After being found down the left by Yasser Larouci, Jake Cain whipped in a superb cross that Duncan glanced in with aplomb. Liverpool were evidently not satisfied, though, and immediately set about the task of increasing their advantage. 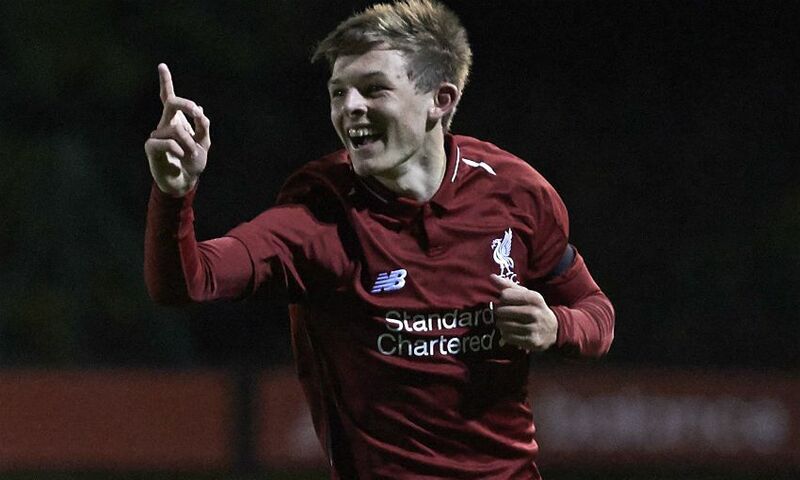 Luis Longstaff scuffed his shot after dancing his way past three challenges and the young Reds’ No.11 then dragged wide from close range following a clever corner routine between Clarkson and Glatzel. 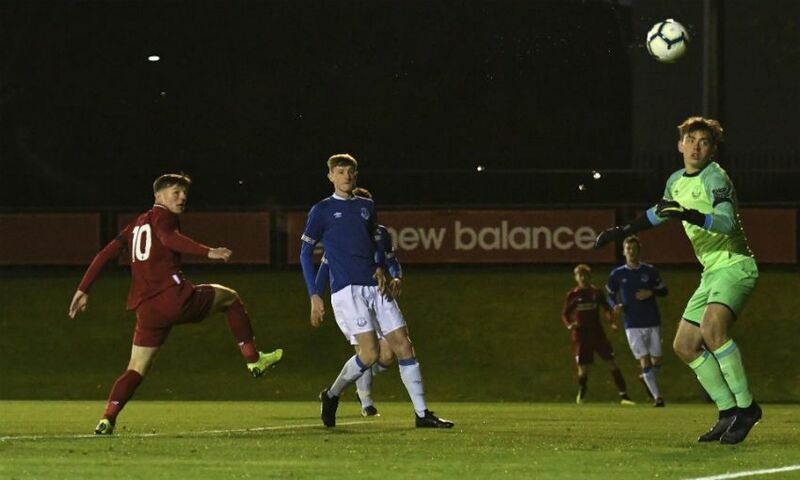 Everton were under siege as Elijah Dixon-Bonner and Larouci tested Harry Tyrer in quick succession, with Glatzel then sending a free header straight at the visiting goalkeeper. As Longstaff’s cross narrowly evaded the sliding Duncan and the striker then saw a powerful cross-shot cleared as Glatzel lurked at the back post, it felt like a matter of time before the game’s second goal arrived. And so it would prove - just not at the end the pattern of play had suggested. Mackenzie Hunt’s neat backheel afforded Adedoyin the space he required to squirm a shot beyond Vitezslav Jaros seven minutes before half-time. Buoyed by that equaliser, the visitors almost went in at the break in front. Phillips, though, saw his curling effort rattle back off the post instead of finding the bottom corner. Just as they had in the first half, Liverpool started the second period on the front foot. And their early adventure was again quickly rewarded, this time through Glatzel’s 10th goal in only his eighth league appearance of the season. 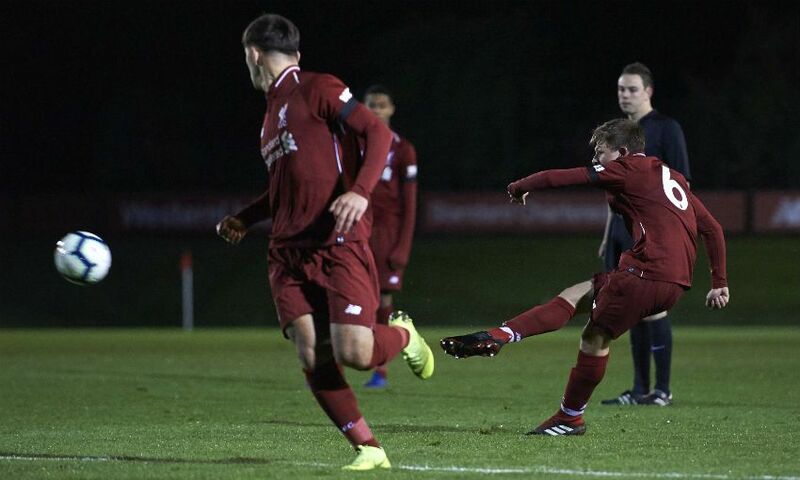 The young Reds’ captain cut inside onto his favoured left foot, navigated his way past two defenders and calmly slotted home. Lewtas’ side were celebrating again soon after when Clarkson planted an unstoppable, 25-yard free-kick into the top corner. Their joy was stymied by Adedoyin’s second goal of the evening, however, as Everton’s No.9 nodded Pawel Zuk’s cross in with half an hour left. It then appeared that Everton skipper Phillips had snatched a point for the visitors when he intercepted Ki-Jana Hoever's backpass and fired in. But Clarkson and Bearne combined to settle a pulsating contest in Liverpool's favour in the final minute. 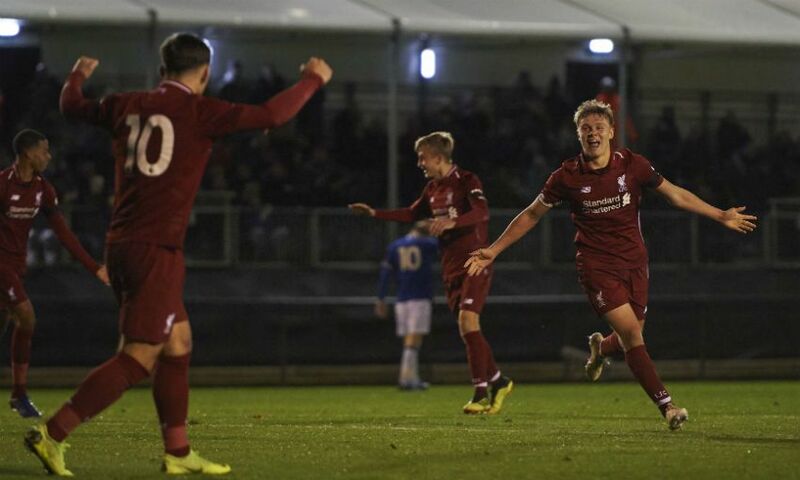 Liverpool U18s: Jaros, Hoever, R Williams, Clayton, Larouci, Clarkson, Dixon-Bonner (Tagseth), Cain (Bearne), Longstaff, Glatzel (Ritaccio), Duncan. Unused subs: B Williams, O’Rourke.